is the headboard Black ir brown? hi I Just wanna know if the headboard is Black ir brown and what made of what material? Hello. 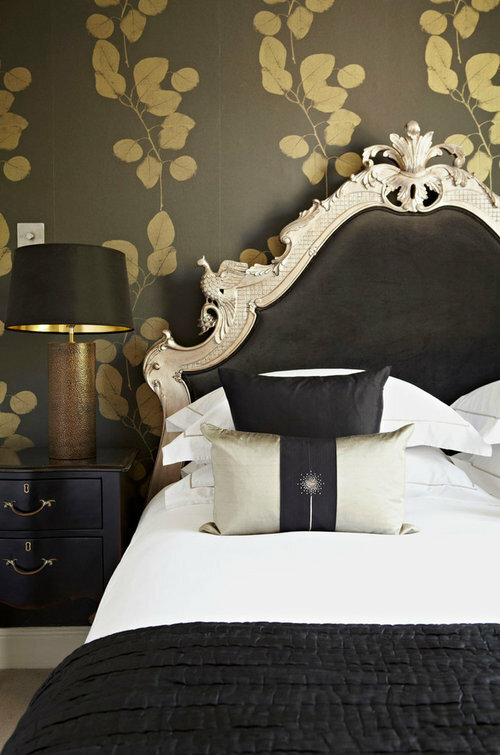 The headboard is upholstered in charcoal velvet. You're welcome! Hi - if you can afford to, I would definitely change the carpet for hard flooring as the carpet softens the look too much. Otherwise you could consider a large jute/sisal rug? The most striking difference would come from changing the headboard, though. Again I wouldn't go with a 'soft' look on this - in fact I think your room is screaming out for the repurposed wooden doors/floorboards/pallets look!! (there are many examples of such headboards on Houzz). If you are handy with DIY you could cut down the headboard &amp; foot boards on your current bed and paint it, but make sure it's still structurally sound. I wouldn't lose the mirror yet - I think it might work with the worn wood/peeled painted wood look. I'd buy an industrial style light flex for the pendant light (black flex, metal end) &amp; fit an industrial-style bulb. LHS wall is a little bright - consider darkening it and fitting wire boxes to the walls for shelving (I'd stick with the 'rule of 3' of these). Hopefully some lower cost ideas for you to finish off what is already a good start on your room transformation! Good luck. Has anyone had blinds made to measure? New extension but is it an economy to reuse old kitchen doors/draws?